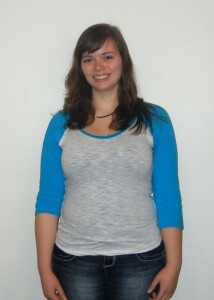 CSU student April Freeman was our second RAC For Life scholarship recipient and her year recently came to an end. April recently had a quick Question and Answer session with me to summarize her year and to talk about what her future holds. Q: How were the last few months? A: The last few months have been very busy. I really wish I would have been able to come in more, but when I was able to, I often met with Ashley (RAC Personal Trainer), which has been wonderful! Although I have not been able to get in as much as I would have liked, the times that I have been able to come in have been so beneficial to me, my goals, and managing my stress of this semester. Q: Looking back, how was your experience at the RAC? A: It has been amazing. Every time I came in, I felt like I was in the perfect environment to do my workout. I felt encouraged every time I walked in the front doors, and I often left feeling tired, but I never left with a bad experience. I am so thankful for this opportunity to spend so much time at the RAC, and I am so sad that this was my busiest semester, so I was not able to take full advantage of my scholarship. A: I have learned that I am guilty of getting completely involved in things and then burning out with it. This has been beneficial to me this year because I was able to try so many classes and features that the RAC has to offer, but in terms of life-long fitness, I definitely need to learn to ease into things slower. Q: Did you achieve the goals you wanted to during the year? A: To be honest, I have not met the physical goals that I had initially set, but I definitely feel healthier, which was my main focus. My physical well-being has benefited so much, but my mindset has also improved. Because fitness is a life long commitment, I understand that I still have a long way to go, but I have had a fantastic start thanks to RAC. Q: Do you feel like you have the tools to work with in terms of achieving your future fitness goals? A: Definitely. Being able to try so many things in such an amazing environment has given me the tools to continue my fitness journey wherever life may take me. I also now know how easy it is to get back into the gym even if life may get in the way for a while. With my scholarship ending, I am going to have to find new ways to continue to workout, but I have gained a love for and commitment to my health. The next RAC for Life scholarship winner will be announced this month. We look forward to introducing him/her and learning more about them in the coming weeks.